Disney’s Moana hits theaters this Wednesday (November 23, 2016) and it is sure to be a crowd pleaser! We had the privilege of seeing it a week early – and it’s a heart-warming story, full of laughs. 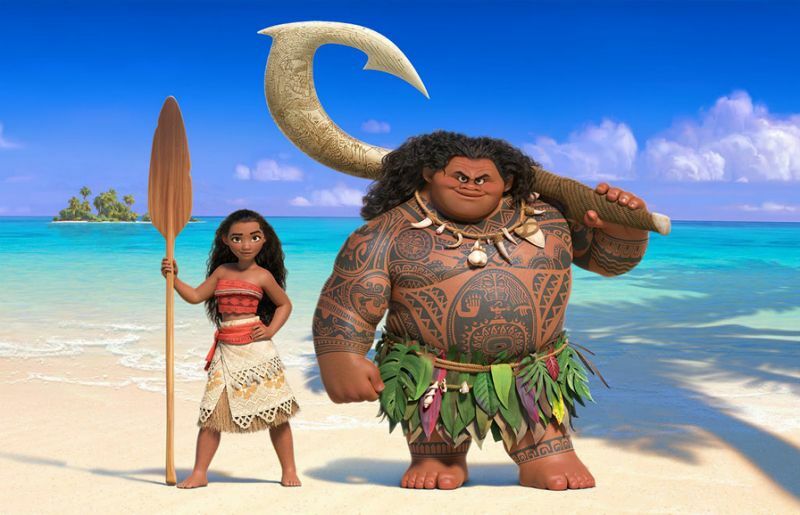 Moana, an adventurous teenager, sails out on a daring mission to save her people. During her journey, she meets the once-mighty demigod Maui, who guides her in her quest to become a master way-finder. Together they sail across the open ocean on an action-packed voyage, encountering enormous monsters and impossible odds. Along the way, Moana fulfills the ancient quest of her ancestors and discovers the one thing she always sought: her own identity. We enjoyed the full movie very much. There was a lot of laughter and not a tear-jerking moment. This movie will be enjoyed by all ages and I have a feeling, that the song How Far I’ll Go is going to become almost as popular as Let It Go. This movie is mostly appropriate for kids of all ages. For those with a Biblical background, you will find the Grandmother’s spirit “returning,” stingray scene and talk of demigods unnecessary. Taken with a grain of salt and knowing this story is purely fictional, you can still enjoy the movie. There is one goddess, Te Kā, whom is depicted almost demon-like and is primarily made up of lava and fire – her appearance can be slightly frightening to young children – however, they’ll be pleasantly surprised at her new appearance by the end of the movie. YES! There is a fabulous and funny scene making fun of The Little Mermaid at the very end of the credits – quite the “laugh out loud” moment. You won’t be sorry for staying! There’s a very quick, cameo appearance by Sven from Disney’s Frozen. Be on the lookout! Disclaimer: My family and I were provided with a complimentary advanced screening of Moana in exchange for an honest review. No other compensation was received.